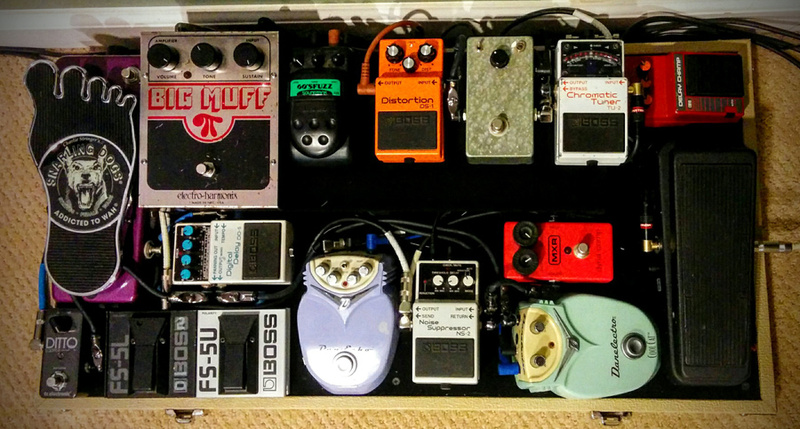 Today’s Pedal Line Friday submission is from James Takacs. If you have a pedal line (doesn’t have to be in a board) for your rig, please email me a photo, bio, description of pedals and routing to pedalline@nulleffectsbay.com. Every Friday I’ll showcase a pedal line submission. Make sure you include any links to your band or music page. Also, here is a reminder to enter the Darkglass Electronics Vintage Microtubes give away. You can enter here. Hi. My name is Jimmy Takacs and I am a personal banker sending this from my work email as it’s easier than typing it all on my phone. I have spent years revamping my board, acquiring what I can through trades as there’s not always money to splurge on new pedals, having a family and a mortgage. Though my board has gone through many stages, I can say that I am quite content with my current chain as it fits my needs quite well. I will do my best to detail the chain without getting too long-winded, though I think there are some boxes here that deserve a little spotlight. Before I get into that, though, the board itself is by NYC Pedalboards covered in blonde tolex and of very high quality. Dry side – Ditto Looper > dry amp: Ampeg Reverberocket r212 circa ’96-’97 w/stock Eminence’s. Wet Side – Dano Cool Cat Chorus > Dano Danecho set for present tape delay sound with quick decay > Ibanez Delay Champ set for darker long lasting delay sound > wet amp: Silvertone 1484 Twin Twelve with original Jensen’s utilizing Boss FS-5L to engage onboard tremolo. With this setup, I am able to achieve the range of sounds that I have spent my playing years looking for and the split amp setup gives me the tone that I have had in my head for years, with the Silvertone providing the punchy mid-range and shimmering highs and the Ampeg handling the full low-mids and bottom end. With one amp off, something is most definitely missing but with both on, it’s like an aural blanket. Darkglass Electronics Vintage Microtubes Give Away!Lightning Boy Audio "It's built like a tank"